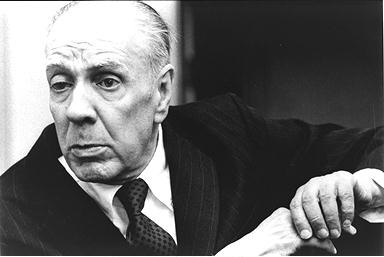 Since the month of June is about to end in a few hours, and I've seen little anywhere about it, I'd like to commemorate the 20th anniversary of the death of Jorge Luis Borges, my favorite writer, who died on 14 June 1986. A few days ago, I discovered a curious confirmation of the way in which what is truly native can and often does dispense with local color; I found this confirmation in Gibbon's Decline and Fall of the Roman Empire. Gibbon observes that in the Arab book par excellence, the Koran, there are no camels; I believe that if there ever were any doubt as to the authenticity of the Koran, this lack of camels would suffice to prove that it is Arab. It was written by Mohammed, and Mohammed, as an Arab, had no reason to know that camels were particularly Arab; they were, for him, a part of reality, and he had no reason to single them out, while the first thing a forger, a tourist, or an Arab nationalist would do is bring on the camels, whole caravans of camels on every page; but Mohammed, as an Arab, was unconcerned; he knew he could be Arab without camels. I believe that we Argentines can be like Mohammed; we can believe in the possibility of being Argentine without abounding in local color. What I find interesting about this is that Gibbon (and thus Borges) was wrong -- there are actually many camels in the Koran. It's hard to believe that a man of Borges' learning did not know that. But since so much of his writing is about fictional worlds and disinformation, one is left wondering whether he did not do it on purpose. Yet, the point he makes is in a way valid: nationalists vulgarly exploit what is commonplace in their country, often adopting the clichés of foreigners in doing so. This is doubly true of nationalists in former colonies, and of course very true of Arab nationalists in particular. There is a lesson in this for all the nationalists who are -- rightly -- protesting what is happening in Gaza. It's about time that the occupation of Palestine ceases to be a symbol of Arab causes, manipulated by governments and the source of unending, impotent anxiety to those who care for the Palestinian people. The Palestinian cause is not an Arab cause: it is a human, a universal, in other words a just, cause. We can be Arab without constant references to it; however, I do not believe we can be human without condemning what is happening in Palestine and wanting to right that wrong. The trick, of course, is now to convince the rest of the world of that. Until then, it's quite clear that the rest of the world simply does not care about Palestine while it remains a mere Arab cause.